New Series of Thrilling Adventures Will Open Monday on Comic Page of "Times"
Los Angeles Times ~ November 23, 1929 Although the thrilling pictorial adventures of "The Beasts of Tarzan" end today on the comic page of The Times, further nerve-tingling escapades of the ingenious man-beast creation of Edgar Rice Burroughs will be resumed Monday in the exciting tale of "The Son of Tarzan." This series depicts Tarzan's boy, at 12 years of age, inheriting his father's strength and love of adventure and he will be found fully worthy of his romantic and indomitable sire. The first of the series was "Tarzan of the Apes," and told of Tarzan being left in the dense forests of the African coast when his father and mother, Lord and Lady Greystroke, died after being stranded in the wild ruthless country. An ape-mother found young Lord Greystroke and raised him. He grew into young manhood among the apes, adopting their cunning and primeval habits, but retaining many human characteristics despite his surroundings. Tarzan was taken from he country by men with white skins, like himself. In civilization he estalished his right to his father's title, but abandoned it and returned to his native forests when his love affair with Jane Porter ended in favor of another man. In "The Return of Tarzan" it is disclosed that Tarzan has made an implacable enemy of the Russian , Rokoff, found cheating at cards on the returning boat. 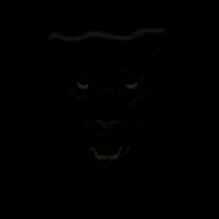 In the Golden City of Opar, Tarzan again finds Jane, and, his rival having died, Tarzan marries her. A year later a child is born. In London where the family begins living as Lord and lady Greystroke, Rokoff kidnaps the mother and child. Tarzan finds the trail and again heads for the jungle. This highly exciting series dealt with "The Beasts of Tarzan." Lord Greystroke, with his primeval knowledge, befriends Sheeta, the panther, and brings Akut, the leader of the apes, to his service. With them he pursues Rokoff to the death but is faced with an equally vengeful enemy in Paulvitch, Rokoff's accomplice. 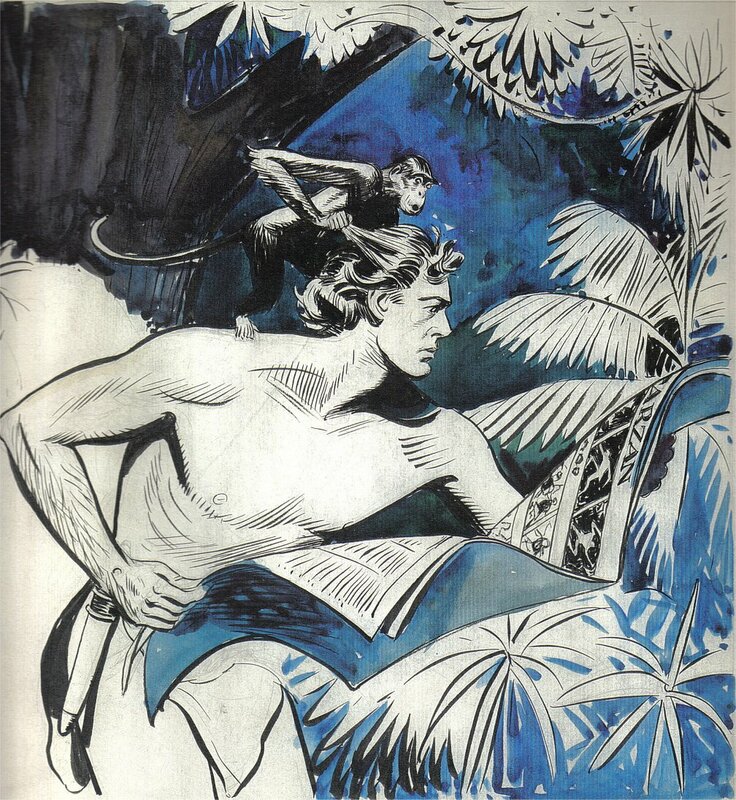 With Sheeta and the apes Tarzan rescues his wife and child but Paulvitch escapes. Reunited with his family Tarzan returns to London. 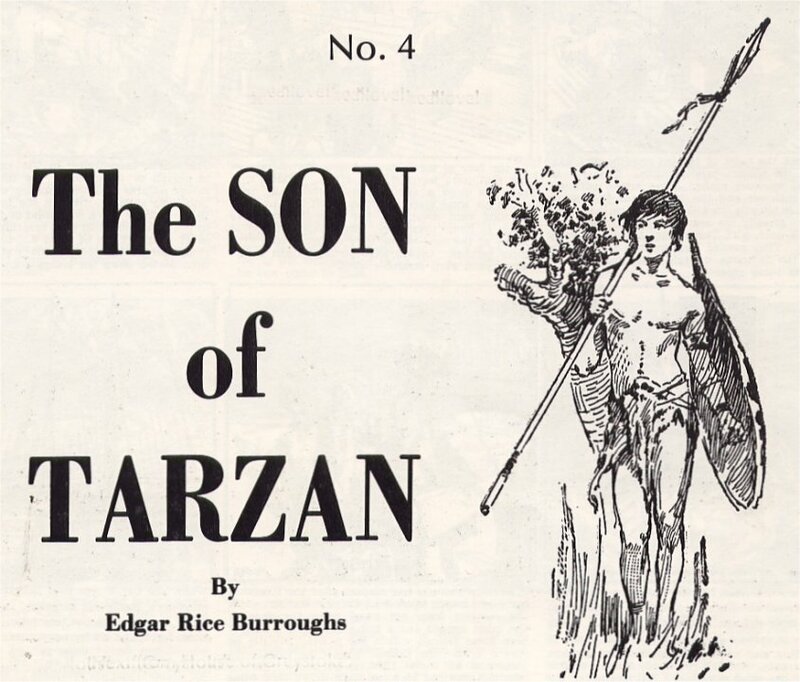 "The Son of Tarzan," beginning Monday, is as swift moving and thrilling as the preceding series of the pictorial exposition of the widely discussed and translated novels of Mr. Burroughs. The boy, a strong likeness of his father, is fearless and adventurous. His mother, however, fearing that love of primitive excitement will lure him from the solid achievements of comfort and civilization, shields him from knowledge of his father's antecedents. But Tarzan's sworn enemy, Paulvitch, pursues his evil designs in the boys life and from them spring the drama and adventures which will be portrayed daily in The Times, beginning Monday.